In the past forty years, since President Nixon declared his “War on Cancer,” cell biologists have found a bewildering array of biochemical processes linked to the multiple mechanisms governing the cell cycle. Cancer is the uncontrolled proliferation of cells through a breakdown of these control mechanisms. For most people, at first, cancer biology is probably almost impossible to understand in its complexity. However, during the past decade, two cancer researchers, Dr Douglas Hanahan (University of California at San Francisco) and Dr Robert Weinberg (Massachusetts Institute of Technology) have made the science more comprehensible by categorizing each of the mechanisms into a framework called the “Hallmarks of Cancer,” a highly cited article in the journal Cell. First, the cell must be able to sustain its own growth signals; second, it must be able to evade signals to suppress growth; third, the cell must be able to resist its own scheduled death; fourth, it must become immortalized and continue to replicate; fifth, it must obtain a blood supply to nourish the growing tumour; sixth, it must be able to invade other tissues and metastasize throughout the body; seventh, energy metabolism within the cell must be reprogrammed to depend on glycolysis; and eighth, the cell must be able to evade immune destruction. 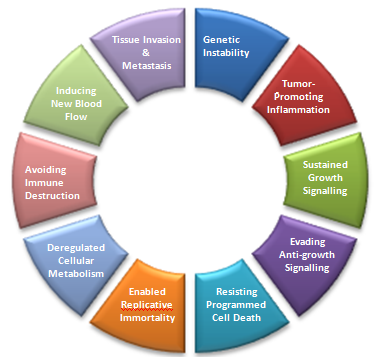 In addition to these eight hallmarks, two “enabling characteristics” are recognized including genomic instability and mutation, which generate the genetic diversity that expedites the acquisition of the hallmarks, and tumour promoting inflammation that can bring about several of the other hallmarks. Finally, cancer cells are able to create their own tumour microenvironment by recruiting and co-opting normal cells in the surrounding tissue. About eighteen months ago, my colleague Leroy Lowe and I used the hallmarks of cancer in designing two workshops, that we called the Halifax Project. The objectives were to address the two central challenges of cancer: how to prevent cancer before it starts (primary prevention); and how to devise more effective and cheaper prophylactic and therapeutic agents that were less toxic. People are continually exposed to a large number of chemicals. Nonetheless, chemicals are generally tested individually rather than in combination. To respond to this challenge, the first workshop was titled Mixtures of Chemicals in the Environment and we set out to “build a carcinogen” from combinations of everyday chemicals that are not suspected to be carcinogens. We set up a task force of eleven teams of cancer biologists, one for each hallmark, for each enabling characteristic and also for the microenvironment. We then paired the task forces with environmental toxicologists to find chemicals that interfere with biochemical processes linked to the control of the cell cycle. The objective was to devise a cocktail from “non carcinogens” that can disrupt each of the hallmarks, to try to determine whether or not these chemicals (which are ubiquitous in the environment) may be collectively carcinogenic and potentially contribute to the high incidences of cancers. The second issue is to address the toxicity, high cost and ineffectiveness of existing therapies, that are narrowly focused on single targets. The second workshop was called Broad Spectrum Therapeutic Design and again we found cancer biologists from around the world, organized them into eleven teams based on the hallmarks framework and asked them to come up with prioritized targets and chemical agents that could be safely combined to act on a broad spectrum of targets (with an emphasis on chemicals in or from plants and foods that are cheap, effective and free of intellectual property rights). The reviews that are being prepared by the teams from these two initiatives will be published in the peer-reviewed scientific literature, together with capstone articles explaining the genesis of the Halifax Project. In addition, the implications of applying the hallmarks of cancer to research and regulatory processes will be addressed. For example, chemical mixtures are currently not considered in a comprehensive manner. Similarly, at low doses that are far below the “safe” doses established by traditional toxicology, endocrine disruptors can cause irreversible effects and potentially contribute to cancer. Both these issues raise difficult questions related to the manner in which these chemicals should be evaluated and regulated in future. After forty years of the “War on Cancer,” skeptics have become critical of our failure to win the war; however, as Leroy Lowe pointed out, cancer biology turned out to be much more complicated than originally envisaged. We now have the scientific tools to address the prevention, prophylactic and therapeutic problems in new conceptual ways. With diligence and patience we will continue to break new ground and hopefully move closer to getting important answers to a problem that has plagued us for too long. Dr. Michael Gilbertson worked for the Canadian Government for 34 years in research, monitoring and regulatory agencies related to toxic substances. In retirement, he is collaborating on epidemiological research on breast cancer related to environmental and occupational exposures.